Traversing the old caravan route between Marrakech and Timbuktu, what appears to be a massive sand castle suddenly comes in to view as though it were a mirage appearing on the horizon. 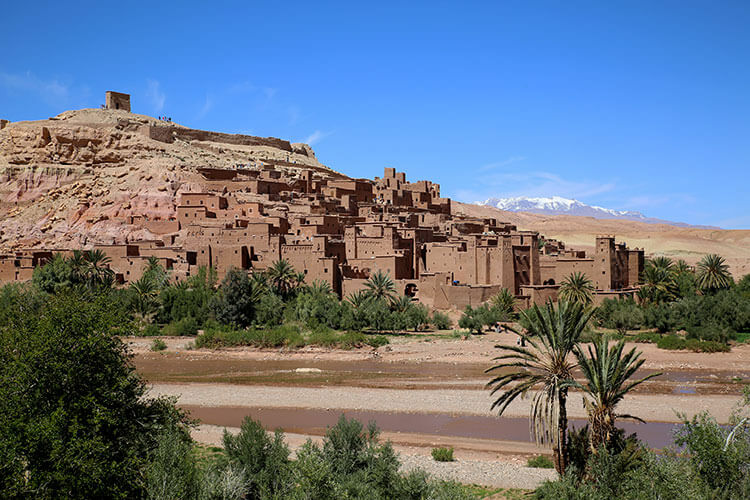 But this is no mirage – it’s the ancient ksar Aït Benhaddou. 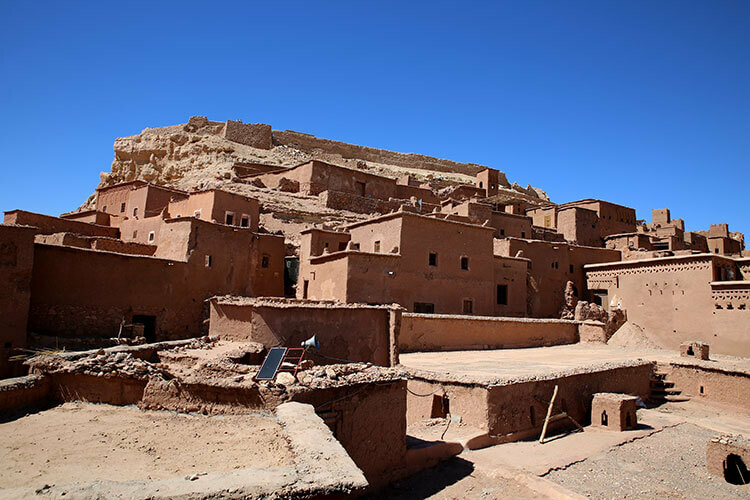 A collection of half a dozen mud brick kasbahs that blend in with the surrounding red-orange sand and High Atlas Mountains, it’s one of the most striking and best preserved ksars in Morocco. It’s also a UNESCO world heritage site and well-worth making the day trip to Aït-Ben-Haddou from Marrakech. It’s present day Morocco, though it feels like we’ve stepped back in time. Or maybe even in to the set of movies like The Mummy. Traders carrying gold, spices and slaves between Marrakech and Timbuktu passed right by Aït-Ben-Haddou. Aït-Ben-Haddou and kasbahs like it were strategic stops for the traders traveling along the old caravan route. There were so many kasbahs that the traders could stop at along their treacherous journey, the route became known as the Road of a Thousand Kasbahs. Though many of the kasbahs lay in ruins today. It’s thought that the current settlement at Aït-Ben-Haddou has existed since the 11th century and was built by the Almoravids. 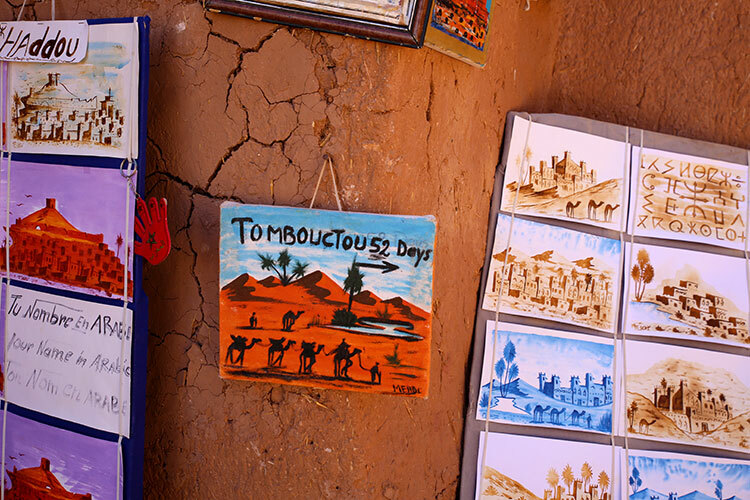 Though the history stretches back much further to when the very first settlement was founded in 757 by Ben-Haddou, and it’s believed that his tomb lay somewhere behind the city. But nothing remains of the 11th century structures. The earthen materials covered in red mud plaster erode with time and weather. And so Aït-Ben-Haddou has been rebuilt many times, with what we see today dating back to the 17th century. In its heyday Aït-Ben-Haddou was likely home to thousands of people and teeming with life. The residents would have had a delicate balance between being hospitable to the passersby to earn a living by providing food, water and shelter, and protecting their ksar from opportunistic invaders. It might look like sand castle that could topple over at any moment, but this ksar was built to defend. Wandering through the narrow streets, you see just how the compact structures within were a line of defense. The maze winds constantly upward toward the fortress at the top, where the residents could escape to in case of an invasion. Today, all but a few families have moved across the river to newer homes in the modern town. Aït-Ben-Haddou is largely abandoned, with the exception of day trippers like ourselves. 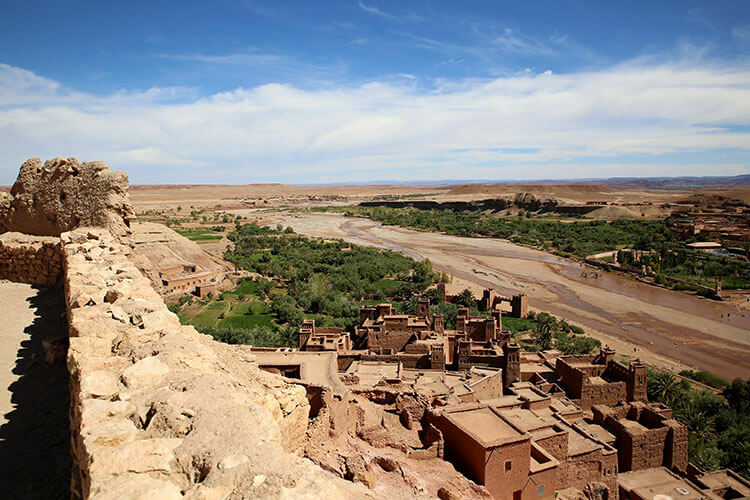 Aït-Ben-Haddou became a UNESCO World Heritage Site in 1987 and the organization works tirelessly to persevere this example of traditional pre-Saharan habitat from further deterioration. We mentioned that Aït-Ben-Haddou feels like a movie set, and that’s because it has served as the backdrop for an impressive list of Hollywood hits from Lawrence of Arabia in 1962 to Gladiator, The Mummy, The Hills Have Eyes and even the popular Game of Thrones tv series. 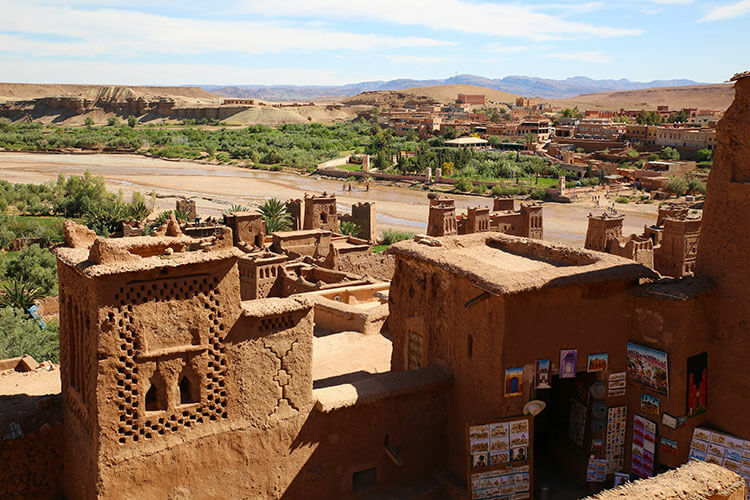 There’s not much to do in Aït-Ben-Haddou itself, other than wander around and soak up the spectacular setting. From the modern town, cross over the stepping stones in the river. If you let some of the children help you across, be prepared to tip them a dollar or two. Make your way back to the modern town, where there’s some tourist shops, a carpet seller and a restaurant, by way of the bridge for a different perspective of the ksar. Aït-Ben-Haddou is located about 31⁄2 hours from Marrakech. There are no buses that stop at Aït-Ben-Haddou, so you either need to rent a car or book a tour. 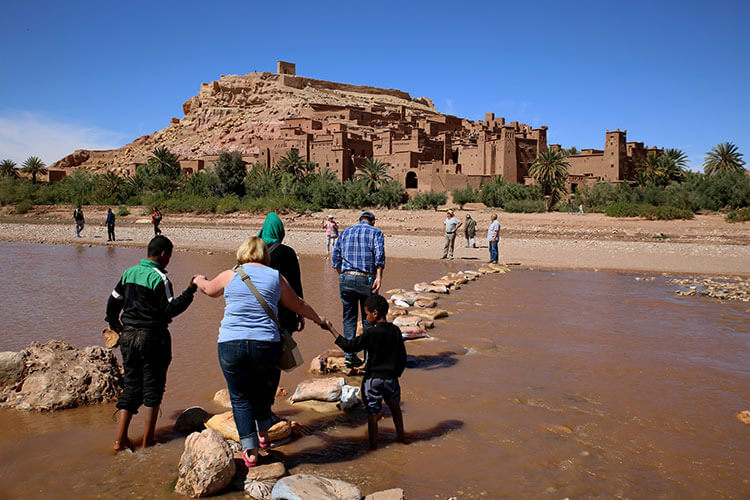 Desert Trips Morocco offers an Aït-Ben-Haddou Day Tour from Marrakech that includes transportation, a guide and lunch at a restaurant in Aït-Ben-Haddou. 52 days from Marrakech to Timbuktu – in retrospect it looks like a fascinating journey; Wow, Ait Benhaddou looks like a favorite with filmmakers – with so many films to its credit. The mono-color structures do look fascinating with their uneven walls. It definitely would have been a challenging one. Even today with modern vehicles capable of crossing the desert, it can be a long and difficult journey! We got stuck and got a flat tire while going to and from the Erg Chigaga dunes in the Sahara. Can you imagine having crossed on camel? The ancient ksar Aït Benhaddou is such a great find. The mud-brick kasbahs that blend in with the surrounding red-orange sand plus the Atlas Mountains still covered in snow combine for such an awesome picture! The snow capped mountains were stunning! We even stopped and had a snowball fight on the drive over the mountains. Aït-Ben-Haddou seems to be a good day trip destination. I am keen to see as many UNESCO sites and so would definitely include this in my itinerary. The view is so monochrome from the fort and the approach path seems tricky. You can always use the modern bridge to cross instead of the stepping stones across the river. We’ve heard the river can even be dry, but with the snow in the mountains it was definitely a river when we were there. I went here last month! You captured Aït-Ben-Haddou so perfectly. When I was there hardly anyone was there and no one offered to help me across the steps, so that’s interesting this happens when it’s busier out. I loved looking in the shops on the road down there. Aside from the locals waiting at the river, there was hardly anyone there either. This is the ONE thing I wish I had done when I was in Marrakech! I only had 3 nights and had to beat jet lag. I am a huge GoT fan and this wouldve been such a dream to see!!!! Just a reason to go back! We definitely want to go back to Morocco because we have so much more to see yet. This sounds so fascinating. 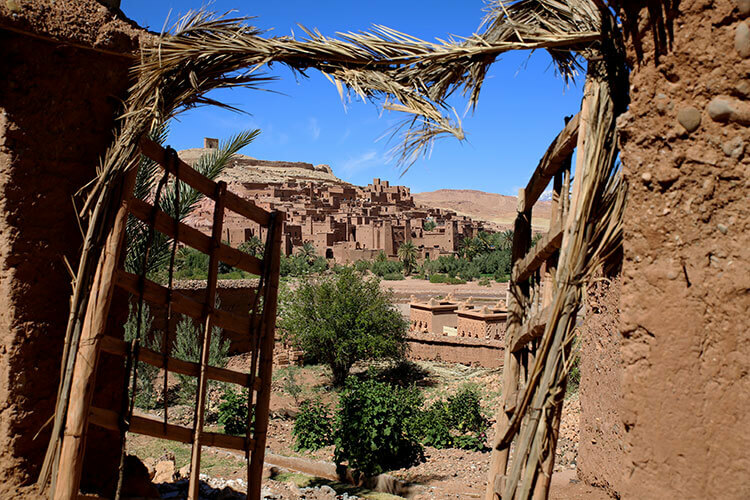 The mud-brick kasbahs blend in with the surrounding and the Atlas Mountains so well.. These make beautiful pictures too. Ooh! I’m so glad I found this post! I’m currently in Morocco and when I go to Marrakech next week, I definitely want to make this day trip! 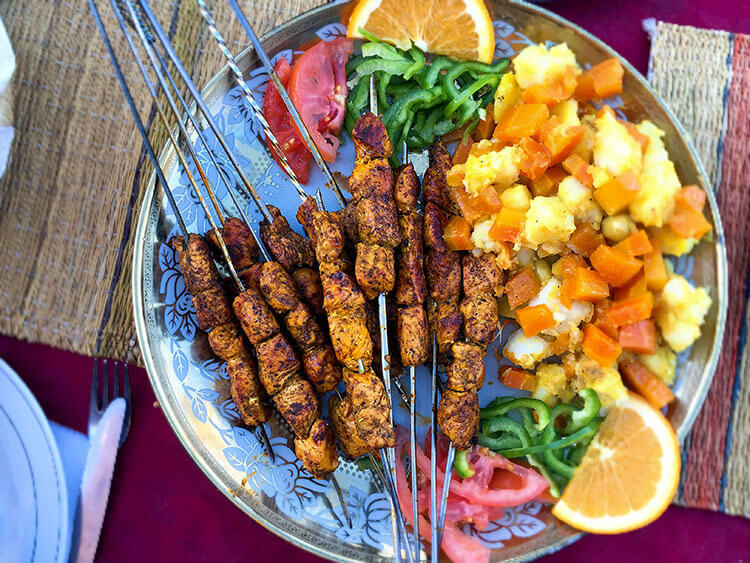 I agree that you can’t go wrong with skewers. I love that view from the top! So beautiful! When you’re in Marrakech, we HIGHLY recommend doing a Marrakech Food Tour. We did the gourmet tour, which is like a progressive dinner throughout the medina. Very cool spot. A lot of travelers are going to the blue city because it\’s trendy right now, but I\’d much rather see a place like Aït-Ben-Haddou! Even though there isn\’t much to do I think I\’d really like it. All the while I was reading your post and looking at the pictures, I kept thinking, its so brown! Even though it has a very unique sort of beauty to it, the colour brown (having lived in Dubai where there’s a lot of sand and matching brown houses’, it just feels like it’s so dull! But I would still live to visit Aït-Ben-Haddou, though the brown seems to make the place a little dull, it also makes it very unique!